Cindis World: Brass ID tags starting at $2.99 with free shipping! Brass ID tags starting at $2.99 with free shipping! 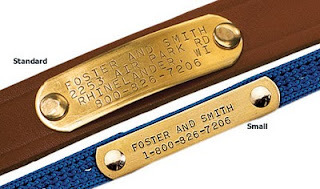 Doctors Foster and Smith have Brass ID Tags for Pets on sale for just $2.99 (cats and small dogs) and $3.99 (dogs). Throw in free shipping and that's about the best price you're going to find on a nameplate that comes engraved! The small allows for up to three lines with 19 characters per line, while the large allows for four lines with up to 25 characters per line. If you have a lot of animals, check out their bulk rates: six or more of the small are $2.59 each, while six of the standard are $3.59 each. Go HERE and order yours now. Those dog collars are neat! Do they come in different colors? Because if I were to buy one of those I would love a pink one. They have tons of styles and colors of collars, but the ID tags are in brass only...I am picking up a few and the personalization wont be name, address & phone, I am gonna put a cute message from me to different family members and then attach them to something I get throughout the year and gift it for Christmas.